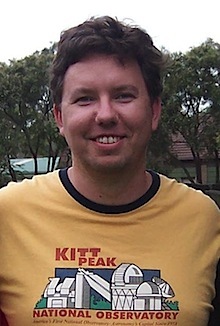 Assistant Professor of Physics & Astronomy Stephen Kane. “There is a great interest in these stars that are known to host planets,” Kane explained, since astronomers suspect that planet formation in a multi-star system would be very different from planet formation in a single-star system like our own. Kane presented his findings today at the annual conference of the American Astronomical Society. Relatively few extrasolar planets have been found in multiple-star systems, “but we know that they are there,” Kane said. In each system, the extrasolar planets were discovered by the radial velocity technique, pioneered at SF State by astronomer Geoffrey Marcy, now at the University of California, Berkeley. The radial velocity technique measures variations in the speed at which a star moves away and toward Earth, perturbed or “wobbled” by the gravitational pull of a nearby cosmic body. Depending on the radial velocity signature, astronomers can calculate whether the wobble is coming from a planet or star. In the star systems studied by Kane and his colleagues, there was a part of the radial velocity data that couldn’t be explained entirely by the pull of an orbiting planet. And at the same time, the planets that had already been discovered in these systems followed eccentric orbits, swinging away from their stars in a less circular and more elliptical fashion, “more like that of a comet,” Kane said. 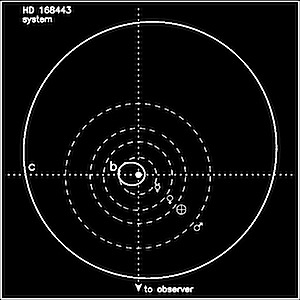 This diagram of the HD 168443 star system shows the planetary orbits of "b" and "c." The overlayed dashed lines represent the the orbits of Earth's inner solar system, which are less eccentric. “I thought we were likely to find stellar companions, and when all four didn’t have a binary star, that did surprise me,” Kane said. But in the case of one star, Pisces’ HD 4230, the unexplained radial velocity appears to be coming from the pull of a previously undiscovered giant planet, the researchers report. They confirmed the planet’s presence with additional radial velocity data collected at Hawaii’s Keck observatory. "Limits on Stellar Companions to Exoplanet Host Stars with Eccentric Planets” is in press at Astrophysical Journal. Kane co-authored the study with SF State Postdoctoral Fellow Natalie R. Hinkel; Steve B. Howell of NASA Ames Research Center; Elliott P. Horch of Southern Connecticut State University; Ying Feng and Jason T. Wright of Pennsylvania State University; David R. Ciardi of NASA Exoplanet Science Institute; Mark E. Everett of National Optical Astronomy Observatory and Andrew W. Howard of the University of Hawaii.